So little time, so many awesome zines. I’m hoping to have a bit more time over the holidays to do some proper zine reading – but for now here are a few zines that I’ve been excited about lately. Hello this is a great idea! The Play-A-Long songbook (but we’re calling it a zine just because) is a lovingly produced A4 compendium of radness. It compiles lyrics, chords and melodies for five songs from some of Wellington’s best known artists – Disasteradio – Wet Wings – Secret Knives – The Sing Songs (with our very own 2nd floor librarian Jeremy!) – Seth Frightening. Also features awesome drawings by one of our favourite zine authors Isobel Cairns. Merry Christmas! 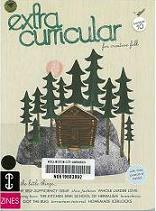 The newest issue of Extra Curricular has hit the zine shelves. Each issue has a theme and issue 10 encourages you to dip your toes into the whole self sufficiency thing. I had a completely lovely time listening to some tunes and browsing through its pages full of stories of regular* type folk creating and doing such inspiring (and yes, self sufficient) things, like – soap making, beer brewing, bread baking, fashion designing, herbal medicine concocting and beekeeping. Beekeeping looks awesome btw, we should so do that! I could live in Extra Curricular. It is good for the soul. I’ve been meaning to share this zine since it came across our desks a few months ago. It thoughtfully brings together photographs of the aftermath of the Christchurch Earthquake with a few carefully chosen poetic words and phrases. To me these collages really expressed both the sadness and emptiness that must be felt by the Christchurch people but also conveyed a real sense of emerging hope. Simple and heartfelt, this zine also includes a beautiful ‘wrap around’ poem by Jennifer.